Recently launched in India, the premium new products from Allergan: Juvéderm® VOLIFT, VOLBELLA & VOLUMA are part of the Juvéderm VYCROSS® Collection. Allergan makes Botox as well. Only the best, at Juverne. The new range of hyaluronic acid-based fillers, are the latest advance in injectables. 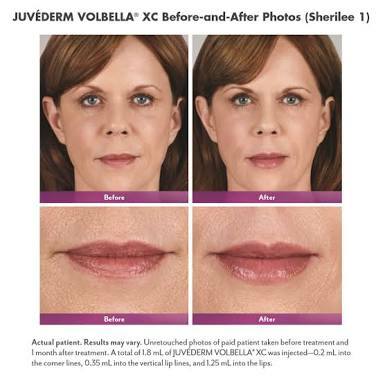 Here's why the Vycross range is considered the Rolls Royce of dermal fillers today. 2. Smoother result: Better cross linking for softer natural non lumpy results. 4. Longer lasting: thus more cost effective. The products in the VYCROSS® Collection are manufactured using Allergan’s proprietary VYCROSS technology - cross-linking the hyaluronic acid molecules to create a smoother, more efficient filler that allows for a lower concentration of hyaluronic acid to be used. Many hyaluronic acid fillers use 100% high molecular weight, while the VYCROSS Collection uses 10% high molecular weight HA with 90% low molecular weight HA, creating a smoother filler with smoother results. A smoother filler means that clients are less likely to experience pain and swelling/after treatment, and results are long-lasting and natural. Juvéderm’s VYCROSS® Collection are among the first hyaluronic acid gel fillers to be clinically proven to remain in the body for up to, and above, a year. Juvéderm VOLBELLA for the LIPS, TEAR TROUGH & HANDS contains (15mg/ml hyaluronic acid) A hyaluronic acid gel filler, for use in treating fine lines, medium-sized skin depressions and for the enhancement and contouring of the lips. It is injected with a 30½G needle. Juvéderm VOLUMA FOR THE CHEEKS, CHIN, NOSE, JAWLINE (20mg/ml hyaluronic acid) A hyaluronic acid gel filler, used for restoring volume to the face, e.g., the cheeks, injected with a 27G needle.